Here are just four of the amazing wonders of the ancient world I have visited in the last four years. 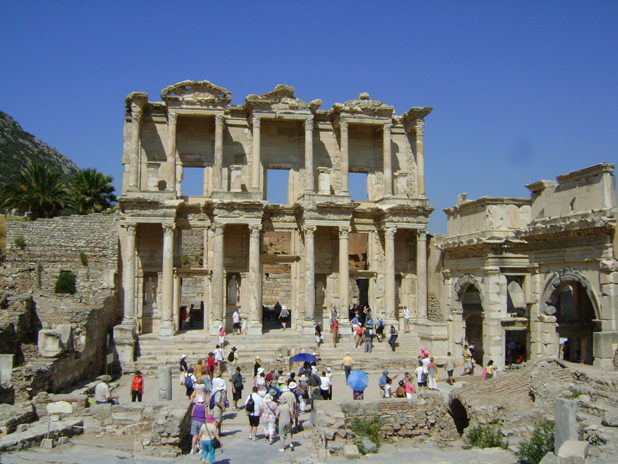 The library was built in 117 A.D as a monumental tomb for Gaius Julius Celsus. It could hold more than 12,000 scrolls and was the third richest library in ancient times after the Alexandra and Pergamum. The statues in the niches of the columns are the copies of the originals and symbolize wisdom (Sophia), knowledge (Episteme), intelligence (Ennoia) and valor (Arete). 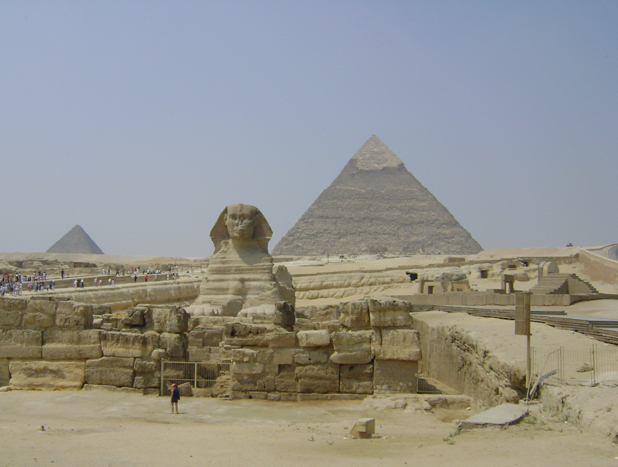 The Pyramids were constructed to hide the tombs of the Pharaohs, the ancient rulers of Egypt. The first pyramids were step pyramids to help the pharaoh climb the steps skyward and join the sun god Ra. Then at about the same time as the Sphinx was carved came the biggest pyramids of all, the pyramids of Pharaohs Khufu and Khafre. Until about a hundred years ago these pyramids were the tallest structures in the world! No earthquake could destroy them. They were each built of more than 2 million blocks of stone and each weighed about as much as a small elephant. The Sphinx was carved over 4,500 years ago for the Pharaoh Khafre. It was carved out of one huge stone and was covered by sand for thousands of years which helped its preservation. Its body is extremely soft rock and its head is very strong rock but is pockmarked because some people used it for gunshot practice. 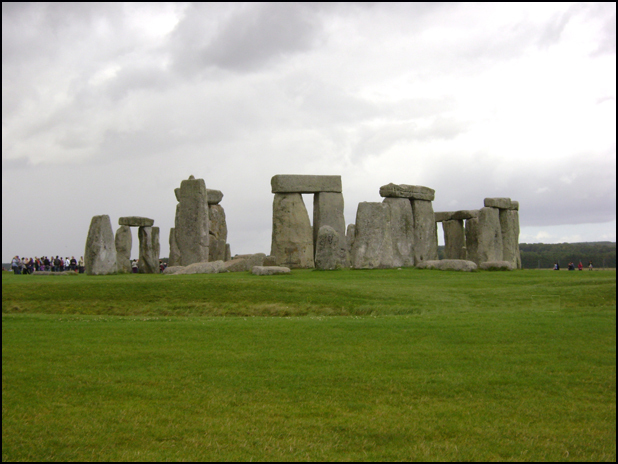 Stonehenge is probably one of the most recognisable monuments in the world. The stones were erected some 4000 years ago. The inner ring of Bluestones came from Preseli Mountains in Wales and many theories have been put forward as to how they were moved. It has been suggested Stonehenge was used as a giant astronomical observatory but the reason behind its construction of Stonehenge remains a mystery. 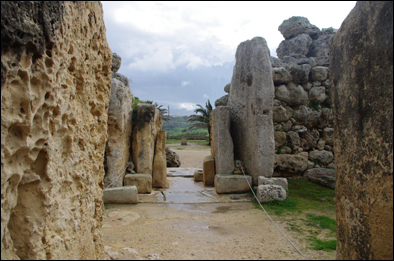 This well-preserved stone-age temple erected about 3500BC on the island of Gozo off Malta, predating Egypt’s first pyramids by about 800 years and Stonehenge by about 1200 years. Like stone circles in the British Isles it may be concerned with the passage of the seasons as indicated by the position of the Sun. This temple is named Ggantija because of the huge blocks of limestone (some as high as twenty feet) used to form the walls of the temple.